Are the Change4Life ‘supermeals’ the change we need? The government is urging us to ‘refresh our menu with some healthier low-cost meals’ – but with packet sauces and extremely low calorie counts, just how healthy are the ‘supermeals’ they’re touting? It’s that time of year when many of us are trying to lose those few extra pounds that might have been gained during the ‘Christmas indulgence’ period. And right on cue, this week the government launched its new Change4Life Supermeals campaign backed by leading supermarkets and celebrity chef Ainsley Harriott. However the ‘supermeals’ recommended in the campaign have come into some (in my opinion, fair) criticism. 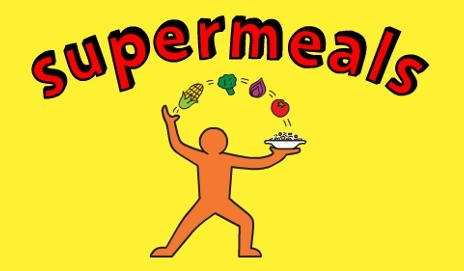 First of all I have a problem with this new invented term ‘supermeal’ – it implies the meal is far healthier and better than other meals. It’s the same as ‘superfood’, which doesn’t mean anything and was invented by marketing people. More surprising is the use of the term ‘supermeal’ when you look at some of the recipes such as ‘quick and easy pollock and leek grills’ and cauliflower cheese, which both use a packet cheese sauce. While I understand that people use packet sauces, they tend to be high in salt, full of additives and are not what I would call healthy. A cheese sauce is not very difficult to make and doesn’t take more than 15 minutes. I appreciate that this meal planner might be aimed at those who don’t cook and so is trying to be as easy as possible, but it is wrong to imply the meals are healthy – and even more wrong to imply they are ‘super’. Healthy does not only mean low calorie – it is about the levels of salt, sugar and fat and also other nutrients present in the food. While a homemade cheese sauce might contain more fat it would almost certainly also contain more calcium, an important nutrient – and to make it lower in fat it could be made using low-fat milk and reduced fat cheese. My other concern is how low in calories some of the recipes are. The super veggie soup, for example, only contains 127 calories per portion – this is nowhere near enough for a whole meal, so you would need to have something with it. A man should aim for around 2,500 calories and day and a woman 2,000 calories. With this in mind a main meal should contain around 500-700 calories. This soup wouldn’t sustain you for long and would probably have you reaching for an after-dinner snack not long after. Instead of resorting to fad diets you might think that following a programme devised by the government would offer a more balanced, healthier alternative. While some of the recipes are fine, I’d look a little more closely before choosing which ones to go for. This actually makes me quite angry. I have always been one to tell people not to mistake nannying for simply giving advice (after receiving which it remains up to you to take it up or not), but if the advice is rubbish and untrustworthy what are we supposed to do? I am not comfortable with “health initiatives” and taxpayer funded bodies, working with businesses full stop! On the list of links, a link to the “NHS Choices Health Checker ” is via the “mysupermarket” website business. Ironic, as they are an affiliate who make very good profits from the supermarkets, by selling analysis of shopping information, making large commissions, which at first sight don’t cost the customer directly more for their purchases, but indirectly do. The commissions the website business makes have to be paid for, by the supermarket they generate them for. This costs EVERY CUSTOMER more money which is recovered by an increase on their prices. How has the “mysupermarket” business managed to have the “NHS Choices Health Checker” on their website? Do government and/or MPs, top civil servants, etc, have vested interests here? Why haven’t the government set up their own website as they have in other NHS areas? I watched a food program only this week, where James Martin the chef, jumped on the english apples bandwagon. On the show, he taste tested apples from an orchard in England and supermarket (he didn’t reveal which one) without exception the public chose the local orchard apple as being the best in taste and quality. He then asked the orchard growers why they were a mile away from a huge orchard, yet not a single british apple was to found in the supermarket down the road? Why do supermarket’s need to grow and import apples from the other side of the world? Could it be that they do this to avoid the strict food safety laws we have in the UK? Not to mention all the carbon emissions generated by the transporting, storage of the process. With this way of operating in mind, and the past reported damaging of our food industry and god knows what chemicals getting into the UK food chain, why would any government in their right mind, put the power, publicity and promotion of a health campaign into the hands of a supermarket? I recall the current lot in charge promising to look after the family unit if they were elected, to vet every policy against the backdrop of what it could do for the family unit, then they go and give this campaign, in part, to a supermarket, who are stinging the public price wise at every turn, via demographics, for obscene profits, whilst shipping basic produce in from abroad instead of buying fresh seasonal produce from right here in the UK. If that isn’t failing to honour an election pledge I don’t know what is. Is it time for a new mattress in 2019?